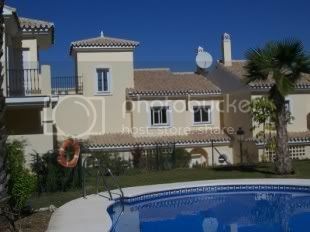 The second property i’m selling is this lovely 3 bedroom townhouse in Alhaurin el Grande. 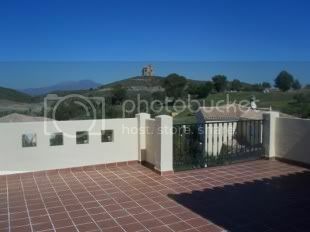 The development enjoys an enviably quiet,rural position with views of open countryside although it is within a short distance of a totally Spanish market town and the new major road link which allows you to be in the heart of Marbella within 20 minutes, to arrive at the airport in the other direction also in 20 minutes and, by use of a more minor road, to be at the sandy beaches of La Cala in a similar amount of time. The clubhouse on the adjacent Golf course is very cosmopolitan and open to all. An excellent place to eat, drink or just to socialise and only a few minutes walk from this property. The whole area is warm, peaceful and safe and the development is bordered on one side by detached, residential villas ensuring the surroundings will remain quiet, clean and unspoiled. This town house has 3 Bedrooms, 2 Bathrooms, 1 ensuite, plus 1 downstairs toilet. The build size is 135.69 m2 + Terrace and solarium 54m2 which equals a very large 109m2 living area – larger than many villas! PLUS a Private garden of 95m2. The biggest on the development! Because this particular house has a feature tower, it has a third floor which would allow for a further bedroom, thus making this a 4 bedroom house. The upper solarium is large, private and enjoys wonderful views – ideal for sun-bathing or barbecues. There is hot and cold air conditioning in every room, double glazing, marble floors and marble bathrooms. The fitted kitchen includes all white goods. 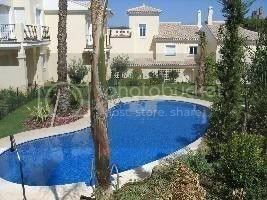 The townhouse has its own, allocated parking space and is adjacent to the prestigious Alhaurin Golf course. Apart from this property making an ideal family home, the rental potential is extremely good – 4 bedroom houses are in very short supply, especially at this price! 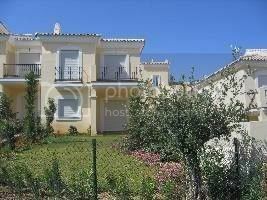 The asking price for this townhouse is just 299,000 €!